Sunrise’s commitment to environmental stewardship is demonstrated by efficient energy management in our communities. The Environmental Protection Agency (EPA) has certified more than 30 Sunrise communities in the senior care facilities category with the ENERGY STAR award. The ENERGY STAR certification signifies that these buildings perform in the top 25 percent of similar buildings nationwide for energy efficiency and meet strict performance levels set by the EPA. These communities use an average of 35 percent less energy and release 35 percent less carbon dioxide than typical communities. To earn the EPA’s ENERGY STAR award, Sunrise focuses on best practices for efficiency in the areas of kitchen and laundry operations, as well as lighting and HVAC&R (Heating Ventilation Air Conditioning and Refrigeration). All of our communities have a comprehensive maintenance program in place to maintain equipment and conserve energy costs. In addition, team members implement energy-efficient best practices in their daily routines to further conserve costs and energy consumption. 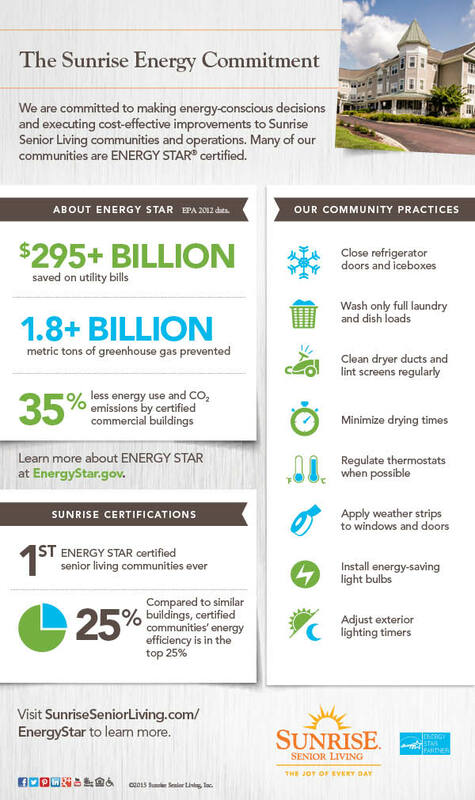 Learn more about our community practices and the results of Sunrise Senior Living's commitment to environmental stewardship in the infographic below. Sunrise continues to improve its energy performance by making energy-conscious and cost-effective improvements to its buildings and community operations, while providing the best home for its residents. Efforts continue to add additional Sunrise communities to the list of ENERGY STAR certified buildings. Look for the ENERGY STAR logo on certified communities’ web pages. Visit the EPA’s ENERGY STAR website for additional information on energy management in senior care facilities.